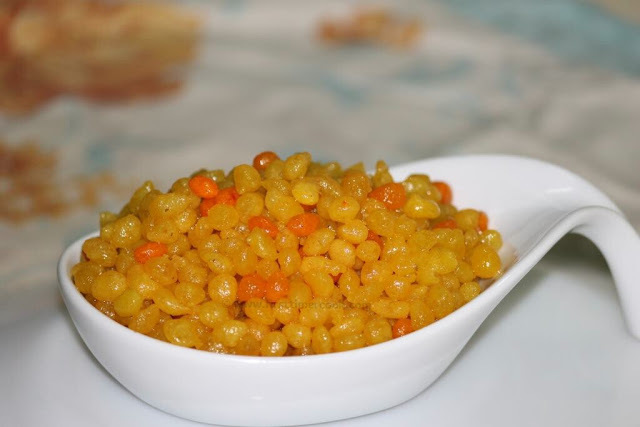 Sweet boondi is my favorite though i don't like sweets as much. The juicy inside the boondi really tastes so nice. Whenever I want to eat boondi, I just buy from outside and never tried so far on my own. So I thought of making this since it was on my to-do list for a long time. Finally I made it and below is the step by step procedure. I'll also make kara boondi (the spicy version) and boondi ladoo as well on coming days. Take gram flour / besan in a sifter and sieve it. In a mixing bowl, mix gram flour, baking soda with water. The batter should be little thick, a bit thinner than normal bajji batter. Take a big ladle full of batter for orange color in a separate small bowl. Add orange food color to the batter in the small bowl, yellow food color to the batter in the main bowl and mix well both separately. Now heat oil for deep frying. Oil should be moderately hot. To test the oil drop a pea size batter in the oil, batter should rise immediately without changing color which means oil is ready for frying boondis. Now hold one slotted ladle just over oil (neither too low nor too high). Use another deep ladle to pour batter over slotted ladle. Pour one ladle full of batter over the slotted ladle and spread in a circular motion by the back of the deep ladle. The batter will fall drop by drop. Fry them till little crispy. Drain and place them on a paper towel to absorb excess oil. Repeat the process with rest of both batter. Then take sugar syrup of 1 string consistency, just warm (no need to boil) up the syrup (warm up is needed if sugar syrup is made before making boondi, skip if syrup is made after making boondi) and switch off the flame. Add in cardamom powder, mix well. Add the fried yellow and orange boondis into the syrup. Gently toss them and mix till boondis are well coated in sugar syrup. Let this set for 1-2 hours untill the sugar syrup completely absorbed by boondis and the sugar crystallized. Now sweet boondis are ready & store them in an airtight container ! Make the batter perfectly, then only round boondi will form. If the batter is too thick, then boondi will form with tail. If the batter is too thin / watery, then boondi may fall flat. So make accordingly & be very careful while adding water. Hold the slotted ladle over hot oil well (neither too low nor too high), otherwise boondi will form with tail too. Adding colors is optional, it can be of single color. Cloves, cashews, sunflower seeds can be added after adding boondi to the sugar syrup.